Young Nigerians clamouring to be the next Nigerian Idol finally have the chance to be a part of the popular show. With the auditions kicking off for Season II, aspiring music stars now have the opportunity to get their voices heard by millions of viewers who love the show. up and top ten finalists also get mouth watering consolation prizes. 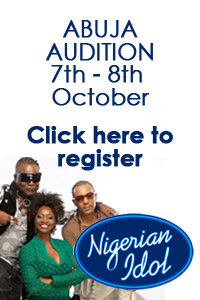 The popular show starts with auditions in four cities across the country; Abuja, Lagos, Port- Harcourt and Enugu. The show begins airing 4th December, until the winner is announced at a grand gala on April 1st 2012. Nigerian Idol is brought to you by Etisalat, in association with Pepsi and Sony. It is also supported by partners, Air Nigeria and Beat FM. printed copy of your application form and 2 passport photos. What does Yinka Davies know about Talent, how many Cds/Award has she got? apart from singing for drunken expatriates at The Sheraton Hotel and playing cameo role in some cheap music video, I watched the last edition, and her criticism was total RUBBISH. Ditch YINKA!! !